The world-renowned lawyer who married George Clooney unveils her Oscar de la Renta dress. He always said he'd never get married again. But that was before George Clooney melt a gorgeous multilingual lawyer with a roster of accomplishments. And now, Amal alamuddin has become a certified style icon, as well. Here's ABC's lama Hasan. Reporter: Day five of the Clooney craze. And today is all about that wedding dress. 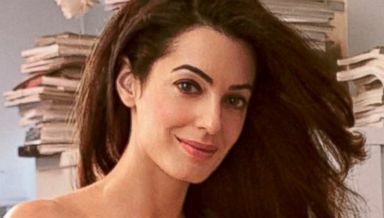 "People" magazine and "Hello" with a first look at the 36-year-old Amal alamuddin making an honest man of George Clooney. In this custom Oscar de la rent French lace wedding gown. Check out that off the shoulder neckline. Those hand sewn pearl accents. And that full circular train. And it is getting rave reviews. That dress. 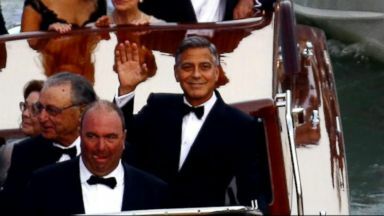 Reporter: George wasn't looking to shabby himself in a custom tux by jgiorgio Armani. His beautiful bride stole the show, from the first day of festivities to the last, turning the canals of Venice into her personal cat walk. Making a splash in this striped doll chai and gabbana number. Leaving a lasting impression in this show-stopping Alexander Mcqueen gown for the rehearsal dinner. Look familiar? First lady Michelle Obama sported a similar version in 2011. More importantly, I started the red dress trend when I arrived in Venice to cover the nuptials. But we both give you our blessing, Amal. And for Monday's civil ceremony, a scream colored lady-like pantsuit by Stella Mccart Nooe. Check out how eager George looks, leading her by the hand as they go to make it official. Also official, Amal's place in the fashion hall of fame. For "Nightline," I'm ABC's lama Hasan in London. "It’s the most important dress in the life of a woman," de la Renta said. The Hollywood actor and Amal Alamuddin get married in what could be the wedding of the year.